Merlin is the BBC's latest Saturday dinner-time family drama programme, occupying the same slot as the popular Doctor Who and the somewhat less popular Robin Hood. The idea behind this new series can be seen as being somewhat the same as Robin Hood: taking an old legend and updating it for modern audiences whilst ensuring it is capable of entertaining an entire family. This makes it sound like that Merlin would be a heavily sanitised, squeaky-clean and inoffensive programme, boring at best and a travesty at worst. To some extent those fears are realised: this isn't the Camelot of Bernard Cornwell's Warlord Chronicles, which is bloody, realistic and brutal, or the mystical exotic fantasy of John Boorman's movie Excalibur. Camelot in Merlin is very clean and everyone has great teeth. That said, it isn't quite as bland as it might first appear. 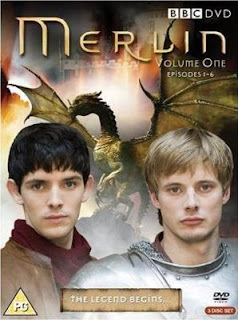 In this revamp of the traditional legend, Merlin and Arthur are both young men. Twenty years ago King Uther Pendragon united the realm under his rule, but in the process fell out with the sorcerers and witches who initially he seems to have been on good terms with. As a result sorcery is now outlawed in Camelot and anyone who uses magic is tried and executed. Uther is fanatical on this point and neither his son and heir, Arthur, nor his ward Morgana can convince him otherwise. The young Merlin, who has innate powers of magic, has left his own village due to his mother's fears that word of his abilities will get out in the small community. Gaius, Camelot's physician and an old family friend, takes Merlin under his wing. After some initially hostile confrontations with the arrogant Prince Arthur, Merlin saves his life and ends up as his manservant. He also discovers a powerful dragon chained under the castle, who informs Merlin that his destiny is to help Arthur grow into a great king and restore magic to the realm. Merlin also befriends the daughter of the castle's blacksmith, Guenivere. The series adopts a formula that it follows throughout the first half or so of the season: a threat arises to Camelot that mundane means are unable to eliminate and Merlin must secretly use magic to deal with it without exposing himself to Uther's wrath. Often, he must ask the dragon for advice, and Gaius' internal conflict over wanting Merlin to achieve his potential and restore magic to the kingdom but also wanting him to avoid execution is usually brought into play. Whilst this rapidly becomes formulaic, it is not offensively so: the actors are all pretty decent, although not always serviced well by the scripts (Angel Courby as Gwen in particular gets a raw deal throughout) and the effects range from the impressive to the corny. For watchable hokum fun, especially for viewers with children, it's decent enough and Colin Morgan brings tremendous enthusiasm to the role of Merlin, although he does need to work a bit on the more dramatic moments. Things get more intriguing in the second half of the season. At this point the series' backstory assumes a larger role in proceedings, and we learn more about the 'Great Purge' that saw magic outlawed from the kingdom. Anthony Stewart Head, previously best known for his role as Giles in Buffy the Vampire Slayer, had been saddle with a rather unsympathetic role as Uther earlier in the season, but he comes into his own at this point as we learn why the Purge was carried out and the reasons for the death of his wife. These revelations also throw some extra depth on the characters of Gaius (accomplished TV actor Richard Wilson) and the sorceress-priestess Nimueh (former Bionic Woman, and EastEnders star Michelle Ryan) whose previously rather random villainy is now given a convincing rationale. In another interesting move, newcomer Katie McGrath is given the chance to shine as Morgana, who begins to suffer from terrifying visions and she really delivers after having only a minor role in the first few episodes. I suspect McGrath is going to be the 'big find' of the show. Anyway, these events feed into the last few episodes of the season, as various plots by outlawed sorcerers to kill Uther and Nimueh's attempts to bring the kingdom down culminate in a major showdown between her and Merlin. The end of the season also has a clever (if not exactly unforseen) scene which places the relationship between Merlin and his dragon ex machina in a totally different light, and bodes for bad things to come in Season 2. At its heart, Merlin is a watchable and entertaining programme which has an unfortunate tendency to dodge any moments or storylines that would entail changes to the show's format. As a result, it is hard to take any scenes of jeopardy seriously. This is not to mention the fact that, although the show plays extremely fast and loose with the Arthurian legend, we can probably guess that Arthur, Merlin, Morgana and Gwen are going to survive for some considerable time. The writers do seem to realise this and develop a habit of putting Uther in considerable danger several times, since we know that inevitably he will die at some point, but after the first couple of occasions this happens this also becomes a bit of a cheap storytelling trick. According to the writers, they have a five-season arc for Merlin that will eventually lead it to more familiar territory, and as such we can hopefully expect the drama to darken and get more interesting next season. For now, Merlin Season 1 (***) remains awash with great potential but doesn't realise that potential in any more than a few episodes. The rest of the time it is watchable but somewhat forgettable. The show is available on DVD in the UK in two volumes. Season 1 will begin airing on NBC in the USA in early 2009. I didn't even realize this show existed until this review. So thanks for brining my attention to the show. For me Robin Hood was okay, nothing spectacular sounds kind of like this show. I'm a sucker for any shows dealing with a Fantasy theme so I'll probably add this one to my netflix queue. Have seen the first few eps and although it is a little "hokey", it's good enough fun that I'll continue watching.